If you were to look in your closet, how many colors would you see? In my case, you would find mostly brown, tan, beige and white. Sometimes a splash of color, but not that often. In regards to our foods, Americans tend to be drawn to convenience and snack foods that are all one color, just like my closet – beige. Crackers, chips, pasta, cereals and other cheap, quick foods all fit into this category. These foods tend to be highly processed and have added sugars, salts and fats. 4 to 6.5 cups and children and adolescents need anywhere from 2 to 6.5 cups of fruits and vegetables per day depending on age, gender and activity level. This statistic alone clearly shows that if we aren’t getting close to the amount we need, then we must be struggling with the variety of colors as well. So why do we need color in our diet, you may be asking? Think about this: don’t you feel great when it’s summertime and you can add a splash of yellow, orange, red or blue to your wardrobe? The same is true for your body. By adding a variety of colorful fruits and vegetables, you are providing your body with hundreds of thousands of different phytochemicals which help to keep you healthy and full of energy. Phytochemicals occur naturally in our fruits and vegetables and work synergistically with vitamins, minerals, and fiber from whole, unprocessed foods to promote good health and lower disease risk. According to the Produce for Better Health Foundation (PBH), phytochemicals may act as antioxidants, which protect and regenerate essential nutrients and work to deactivate cancer-causing substances. 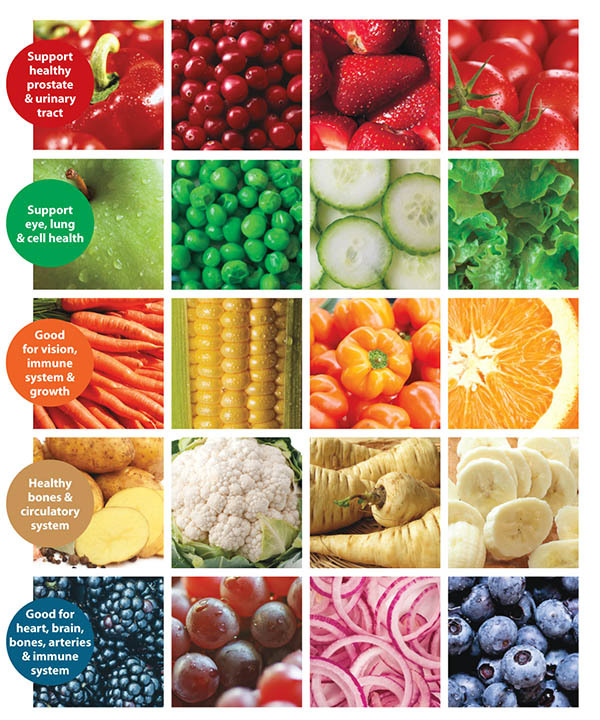 Each color, and more specifically each fruit and vegetable, represents a unique spectrum of phytochemicals. By eating a variety of colorful whole foods, you are providing your body with a wide array of health promoting and disease fighting nutrients. In this case, beige alone just does not cut it! > Natural plant pigments called lycopene and anthocyanins provide the red color. > Lycopene is a carotenoid, a powerful antioxidant that may help reduce the risk of several types of cancer, especially prostate cancer. The most concentrated source of lycopene is found in tomato products. Specifically, cooked tomato products such as tomato sauce with a little bit of fat (olive oil) are absorbed better than lycopene from raw tomatoes. > Anthocyanins can be found in strawberries, raspberries, cranberries, red grapes, rhubarb and beets. They act as a powerful antioxidant to support a healthy urinary tract and may promote a healthy heart by lowering blood pressure and cholesterol. > Examples in the red group: red apples, pomegranates, red potatoes, watermelon, pink grapefruit, blood oranges, red cabbage, cherries, radishes. > Green color is from a natural plant pigment called chlorophyll. > According to PBH, the phytochemicals idoles and isothiocyanates found in broccoli, cabbage and other cruciferous vegetables may help protect against some types of cancer. > Leafy greens are an excellent source of folate, which is a B vitamin that is essential during pregnancy. > Green vegetables are excellent sources of potassium, carotenoids, omega-3s and vitamin K. Diets high in potassium are linked with lower blood pressure; vitamin K is necessary for blood clot formation. > Examples in the green group: honeydew melon, artichokes, kiwi, asparagus, lettuce, avocadoes, limes, green beans, green onions, Brussels sprouts, green pepper, spinach, zucchini, green grapes. > Carotenoids, a natural plant pigment, provide their color. > Beta-carotene, beta-cryptoxanthin and alpha-carotone are all orange friendly carotenoids that can be converted in the body to vitamin A, an integral nutrient for vision and immune function as well as skin and bone health. > Considered eyesight foods, they also play a role in overall immune health, heart health and reduced risk of cancer. > Examples in the yellow and orange group: yellow apples, peaches, apricots, pears, butternut squash, yellow peppers, cantaloupe, persimmons, pineapple, grapefruit, pumpkin, lemons, mangoes, yellow summer or winter squash, nectarines, papaya. > Allicin is a health promoting chemical found in the white group that may help to lower cholesterol and blood pressure, as well as reduce the risk of stomach cancer and heart disease. > The largest class of phytochemicals are the flavonoids which are, for the most part, colorless. These are powerful antioxidants that help the body counteract free-radical formation, which fights disease. Flavonoids are found in a variety of the color groups. Think of the inside of an eggplant or an apple, which is white. This is an example of where they can be found within all the color groups. > Examples in the white group: garlic, onions, parsnips, turnips, white asparagus, ginger, jicama, mushrooms. > A natural plant pigment called anthocyanins provide their color. > Anthocyanins act as a powerful antioxidant that protect cells from damage, promote heart health and healthy blood pressure. > Blues and purples also help to reduce the risk of stroke and may help lower the risk of cancer. > The darker in color blues and purples are, the higher the phytochemical concentration. the highest antioxidant activity of all fruits and vegetables. Other studies show that eating more blueberries is linked with improved memory function and healthy aging. > Examples in the blue and purple group: eggplant, figs, plums, prunes, raisins, purple asparagus.